ZOMG! 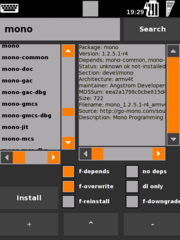 is a graphical package manager similar to assassin, but contrary to assassin it is not limited to Om2008.x and it features full package management (Beta version! tested on Om2008.9). It's written in Java, so the startup time is... well you know. ZOMG! needs an internet connection to install applications for the repositories. This can be done via WiFi, USB, GPRS or Bluetooth. Hit the + button at the bottom. The Installer screen will appear. You can either directly pick a package from the list or search for a package (in name an description) and pick it then. Hitting the Install button will install the selected package. If you dont want to use the default configuration for installing a package you can enable some command line options via the checkboxes. Hit the - button at the bottom then proceed as you would at the Installer screen. Hit the Repo button at the home screen. The Repo Management screen will appear displaying you current feeds. You can remove a selected feed by hitting the remove button (for further details about automated backup-ing see Notes). To edit a feed simply edit the corresponding text fields and hit Save/Add. Adding a new feed works the same (The Save/Add button doesn't get enabled before every textbox is filled out). First beta Tested on Om 2008.x - works! Yay! NOTE: ZOMG! must be already installed to make the update work! To update simply re-run the installer script as described further down. Packaged into an ipk package for *almost* hands-free installation. Fixed one critical bug which could break you opkg feeds (don't panic) if it happened it can easily be undone, by hand-checking the feeds you edited (The only way this could have happened to you is if you have edited the feed-title, but not the feed (file)name). I know it's redundant but if you are using SHR/FSO please add the Jalimo repos if you want ZOMG! (or any other java se app) to work on SHR. You can download the sauce @ opkg.org. When removing a feed it doesn't get deleted it will be renamed to feed_file.bak Same applies to editing an existing feed. ...safety first! This page was last modified on 19 July 2009, at 10:21.